Well I hope you have been having better weather than we have – it is apparently only 2 weeks until the official start of Summer but we have seen very little of any nice sun. I am itching to wear something other than a thick coat and gloves and hide from the rain. However I am very lucky as I am off to Spain in 8 days so I will get some sun there. 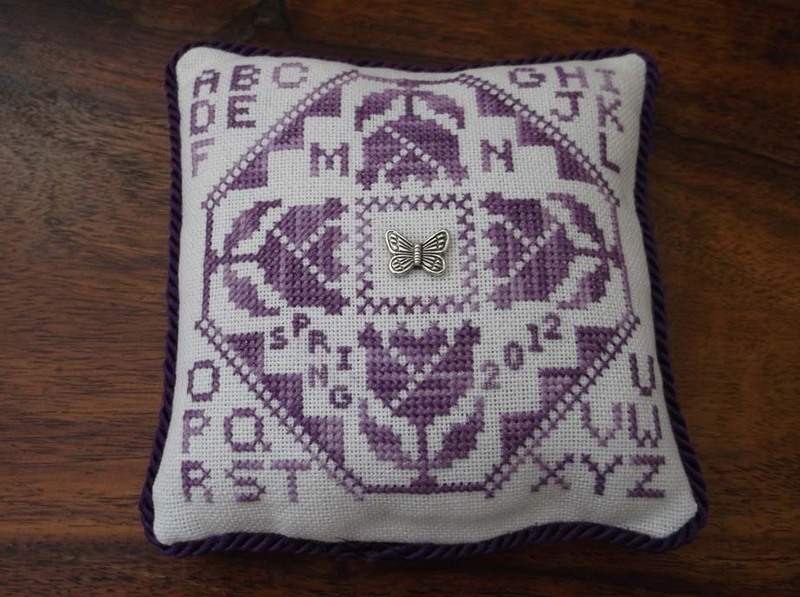 Spring things have been happening though – I have been clearing out my garage as part of a bit of a Spring clean and there has been Spring stitching. As I mentioned last week not much has been going on craft wise due to general busyness but I have done a bit of knitting this week and have done the latest piece for my exchange through the Seasonal Exchange blog . My Spring Exchange piece for the exchange has just arrived with Lei in the USA so I can reveal it. It is another design from The Workbasket site called Quaker Tree and I have stitched it with Silk Mill threads as usual. The fabric is some that I have had in my stash for a while, I think it might be Tanya Whelan but I bought it from my friend Lydia’s shop Spun a while ago. 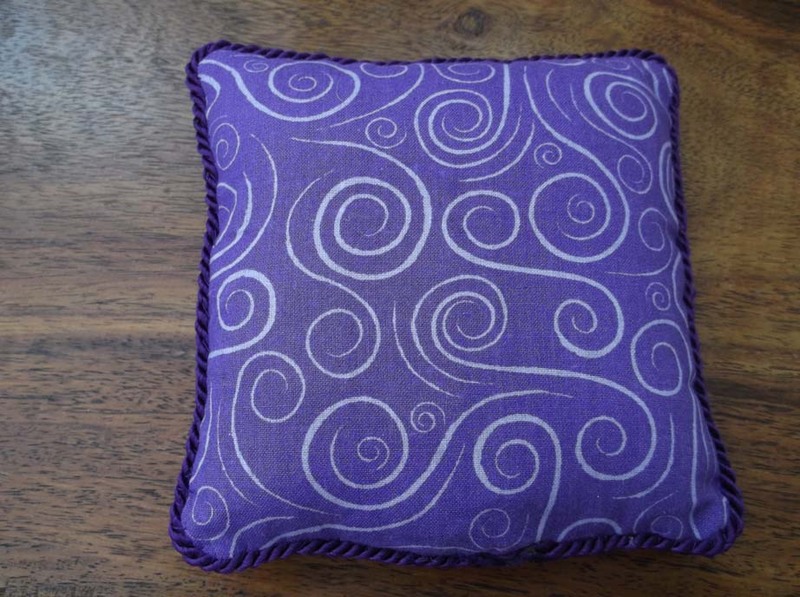 I thought it was lovely and bright and I decided to do a new type of finish for me with a little pillow. Lei likes it which is very good. 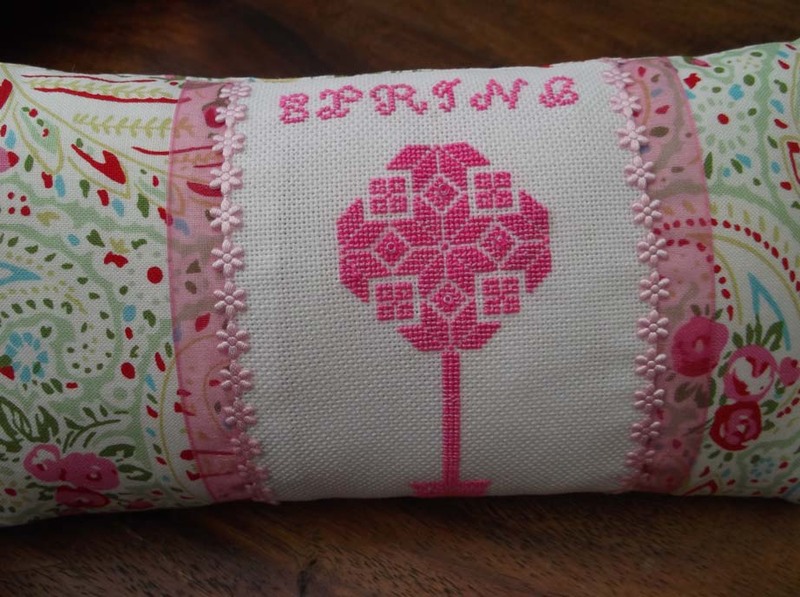 I have also just got this wonderful pillow from Lisa in the USA as my Spring Exchange ornie, she must know my tastes very well as she has stitched me a lovely design from The Workbasket site, I love their pieces and this is fantastic. It is called ‘April Quaker’ it looks so lovely with my other ornies in the conservatory. By the way The Silk Mill is having a sale at the moment to celebrate their 10th anniversary with at least 10% off depending on how much you order. I am planning to go and add to my stash as I can’t resist a bargain. Well I hope that you have a great week and see you all again soon, thanks for visiting. Hope you’re now enjoying the hot weather – it’s not very hot by Spanish standards, but in West Yorkshire it counts as a heatwave!